BRUSSELS, Belgium -- The Dutch senate approved ratification of the EU-Ukraine free trade and association agreement on Tuesday (30 May), bringing to a close a political saga that started over a year ago when Dutch voters rejected the deal in a referendum. 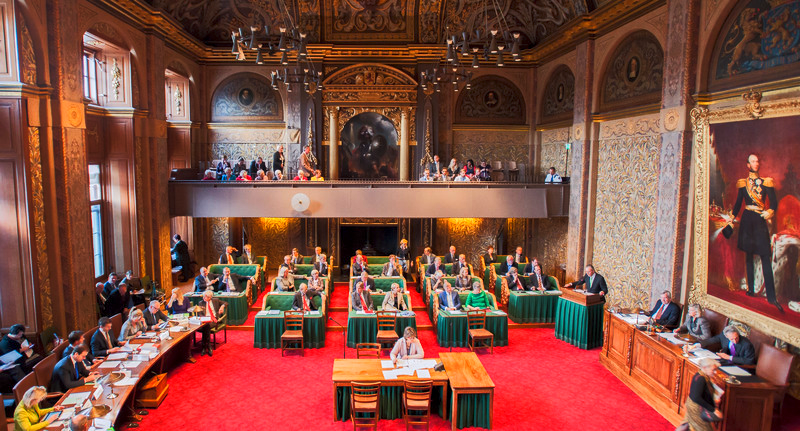 The Dutch senate approved ratification of the EU-Ukraine association agreement. Almost two-thirds of the senate voted for ratification, with opposition coming mostly from far-left and far-right parties. The vote of the centre-right Christian Democratic Party was crucial, after they had opposed ratification in the lower house of the parliament. During this year's election campaign, the lower house christian-democrat leader, Sybrand Buma, had threatened to “throw” the EU-Ukraine agreement “in the bin” if he became prime minister. But his colleagues in the senate voted differently. Only three of twelve christian-democrat senators voted against. “We make our own consideration,” said senator Ben Knapen, a former minister for EU affairs. He noted that the country's EU allies were counting on the Netherlands to ratify the treaty signed in 2014 – it was the only EU country that had not yet done so. “Reliability and dependability are crucial characteristics for a small country that has to rely on its European surroundings,” said Knapen. Two years ago, the two houses of the Dutch parliament had already approved ratification. But in October 2015, a group of citizens used a new Dutch law that allowed them to force the government to hold a non-binding referendum about a recently passed bill. The vote was held in April 2016, and Ukraine treaty was rejected by 61.1 percent of those who showed up to vote – with a low turnout of 32.2 percent. Although the referendum was non-binding, the Dutch political establishment decided they needed to "take the outcome into account". Centre-right Liberal prime minister Rutte did not want to flat-out ignore the results, or push ratification through, and set out to find a third option. At an EU summit in December 2016, he found it: the Dutch leader convinced his 27 counterparts to support a text that explains what the treaty is about. The declaration noted, among other things, that the treaty does not guarantee EU membership to Ukraine, and that the Netherlands is not obliged to provide Ukraine military assistance. Rutte said that the declaration would address the concerns of the No voters in the referendum, although opposition parties that campaigned against the treaty disagreed – as the treaty itself has not been amended. With the senate's vote, the ratification process has been completed for the entire EU. However, the treaty had already been applied provisionally. Meanwhile, the centre-right MP, Buma and his party, failed to become the largest at March's elections. This means he stands little chance of becoming prime minister and can forgo on his promise to "bin" the treaty. However, it is unclear which parties will make up the next government, following two failed attempts at a four-party coalition. The European Commission was quick to respond. Just minutes after the vote, it sent a press release with a comment from EU commission president Jean-Claude Juncker, who during the referendum campaign had said a No vote would trigger a “continental crisis”. "Today's vote in the Dutch senate sends an important signal from the Netherlands and the entire European Union to our Ukrainian friends: Ukraine's place is in Europe," Juncker said on Tuesday.